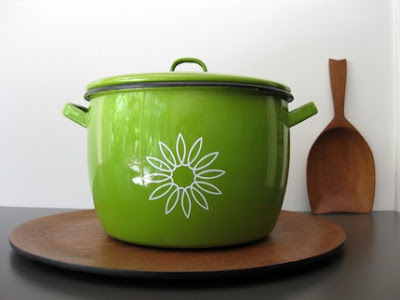 What: vintage enamel pot with floral graphic, mid century modern. Why: Love the green, the retro graphic flower and the way they styled this photograph! We're honored to know that someone with such great taste likes our store! As a measure of our appreciation, we're extending a 10% discount to all Jurianne Matter blog readers for the rest of the 2009 calendar year. Just Convo us with discount code: WM09Jurianne. Thanks for sharing The White Mole with you readers, Jurianne!